Flexible Scope Repair | MediVision Inc. In our FDA and ISO 13485:2016 certified facility, we service all types of flexible endoscopes including bronchoscopes, colonoscopes, duodenoscopes, gastroscopes, and ureteroscopes. Olympus® is a registered trademark of Olympus. Pentax Medical is a registered trademark of Pentax. MediVision technicians are highly trained in diagnosing and repairing these issues. We work quickly and effectively to ensure that your scope is returned in full working condition in just a matter of days. Once the scope arrives, they go through inspection to find all defects. You will then be contacted with an estimate that will then provide a list of corrective actions. 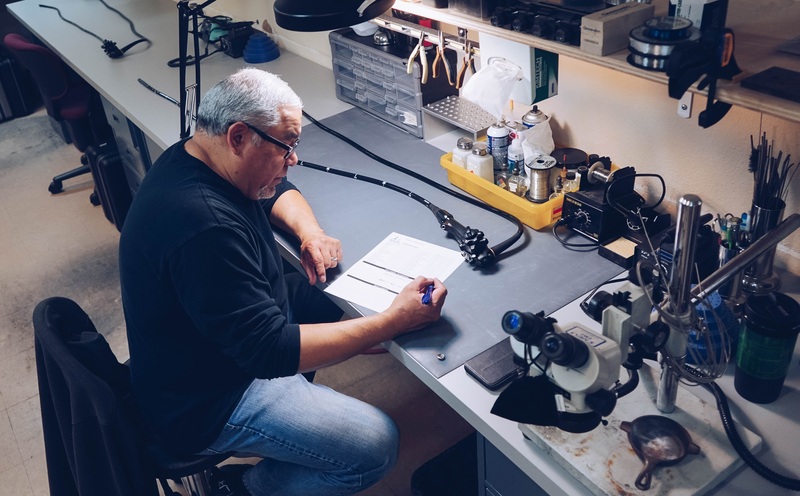 Our repair technicians are trained and ready to explain the repairs needed in whatever detail is required in order to keep our customers confident while their scopes are being worked on. Once the estimation is approved and a PO is provided, a technician will begin the detailed repair process using only the highest quality parts available. Before the scope is returned to you, the scope will go through a thorough inspection to ensure the scope is fully fixed and functional. At MediVision, we do not want our customers work to be interrupted. In order to keep our customers work flow continuous, we offer loaner scopes while your scope is in repair at MediVision. Our inventory includes a modern collection of scopes ensuring that we can find a similar model to the scope being repaired to keep you up and running.